I noted that the real battle is between H.265 and VP9 and not H.264 and VP8 nowadays. H.265 or VP9? The fight is only beginning. I really thought it was a done deal when Google announced their roadmap for WebRTC, where VP9 was there as a new experimental addition. VP9 is the future of VP8. It is the next royalty free video codec proposed by Google and is in direct competition with the H.264 and H.265 line of codecs. The way I saw it, is that while everyone is competing if the mandatory video codec should be VP8 or H.264, Google pulls out the VP9 rabbit and just sidesteps that debate altogether. When it comes to video codecs in WebRTC, the forces that decide which ones are going to be used are the browser vendors. So what happens now, that iPhone 6 got released and its specs include H.265 support for FaceTime? How will that affect a future debate? While Google is planning on adding VP9 support, Apple has millions of mobile devices in users hands already running H.265. Google is working on getting VP9 ready for prime time. They need to fit it in to multiple types of hardware, mostly with no hardware acceleration suitable for the task. This means that much of the effort takes place in software. A huge undertaking. They already have VP9 decoding in YouTube for many of us, but that’s different than real time bidirectional video. End of this year having it as an experimental option in WebRTC in the browser is probably a year ahead of any official release, and a bit more from mobile yet. There’s also the daunting task of getting chipset manufacturers to add hardware acceleration suitable for VP9. An 18 month cycle at the very least. Apple has a vested interest in the H.26x line of codecs. It is part of MPEG-LA, so it enjoys royalties and a barrier of entry for others in this space – for both H.264 and H.265. Its current devices run H.264 in hardware, so adding H.265 was the obvious step in its A8 chipset for its new iPhone 6. Enabling it for FaceTime means better video quality for FaceTime than anything out there today (at the same bitrate), and also shows that H.265 is ready for mass production. It also means it can use higher video resolutions for FaceTime on its retina displays for the larger screen sizes it has on offer now. 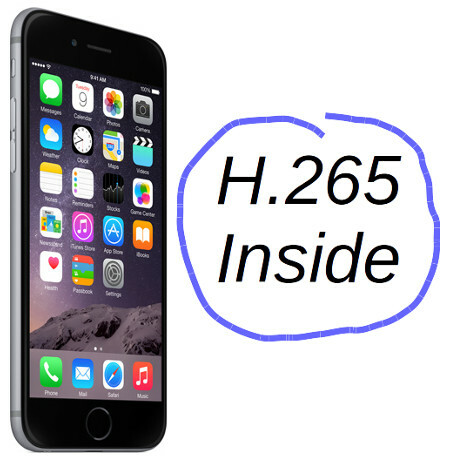 Apple might have added VP9 hardware support in their A8 chipset, but if I were Apple, I wouldn’t say that until the debate on the video codec in WebRTC is over – why lose a strong story around H.265? The decision of the mandatory video codec in WebRTC is as far as ever. We might see a shift in gears from H.264/VP8 to H.265/VP9 debate, but other than that, I don’t see this one concluding anytime soon. If Microsoft and Apple do get their act together and offer WebRTC in their browsers, I am afraid it won’t have video interoperability with Chrome in its initial releases. No matter which one is better, I prefer H.265. Good News is that Pavtube continues to be an industry pioneer by announcing today that Video Converter Ultimate (VCU) now offers HEVC/H.265 compression, the new upgraded Ultimate Converter is available now. This HEVC Converter is integrated of HEVC H.265 encoding and decoding. As a professional HEVC decoder, HEVC H.265 converter can decode and convert HEVC H.265 video in various resolution like 4K UHD 4320p, 8k to iOS devices supported video. As an excellent HEVC encoder, HEVC Converter can encode and convert HEVC H.265 from various video formats like MP4,, AVI, FLV, MKV, WMV, etc, or even Blu-ray or DVD. It can not only reduce file size but also improve quality using the same bitrate. What’ more it can be take as a H.265 player to load your H.265 video for previewing. And to learn more about the benefits of higher H.264 encoding efficiency for HD and 4K challenges, read here.